Tanning beds can help raise Vitamin D levels- but we are not advocating it! Sunscreen with SPF of 30 effectively blocks out UVB rays, hence indirectly reducing Vitamin D production by up to 95%. This piece of info was gleaned from the Journal of Clinical Endocrinology and Metabolism 2011. Hope this has given you some food for thought. I personally recommend a Vitamin D shot into the muscle 4-6 times/year for paler skins and 6-8/year for darker skin tones; spaced out more during summer months. 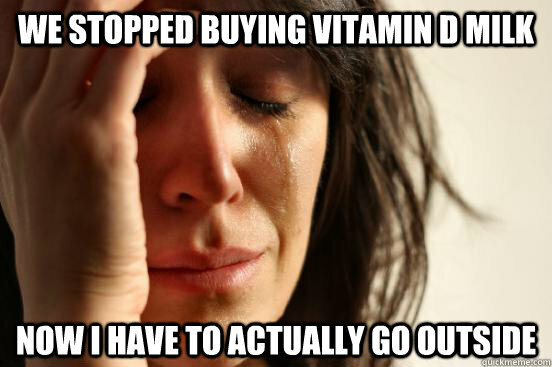 Some people prefer taking higher dose Vitamin D orally. I personally prefer injections as they are easy to administer and receive. Plus I don’t have the hassle of having to remember to consume them. For me, I always know when I’m running low on Vitamin D when my temperature regulation goes out the door. Cold feels too cold and hot feels too hot. This reminds me, I think I’m due for my winter shot now….